We all want those voluminous lashes that you see on television and magazine ads. But let’s face it, no mascara will create the same eye-widening impact as a pair of stick on lashes. 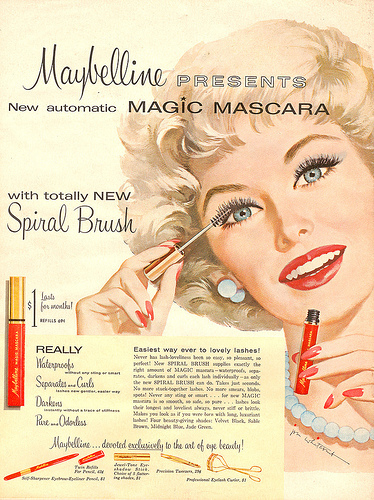 Despite the advertising attempts, as in this 1960s Maybelline ad, there is no ‘magic mascara’. Besides, all those models are wearing false eyelashes anyway! I love wearing false lashes and have pretty much tried them all over the last few years. From individual lash extensions, to celeb lashes, to the cheapest ones money can buy. But if anyone ever asks me which are the best, I always recommend the Eylure Girls aloud lashes. Each of the five girls has there own individual design, my personal favourites are Cheryl’s design. They are quite natural but still have a nice fluttery effect. There are so many brands on the market now, and it seems more and more celebs are jumping on the bandwagon. From Girls Aloud to The only way is Essex and word on the street is, Katy Perry is bringing out her own range of lashes this year. I can’t wait til they hit the shops so I can try them out!! This entry was posted in Beauty Review, Tried & Tested, Uncategorized and tagged beauty, Eva Longoria, eyelure, false eyelashes, girls aloud, katy perry, l'Oreal, Maybelline. Bookmark the permalink.